Ecology, history, commerce factor into Troutdale wetlands mitigation. Huge machines work in the distance stacking logs and root balls as Carrie Butler trudges the gravel road winding through a massive reclamation project just north of Marine Drive. She steps off the road to let a truck pass before it begins shooting a slurry of native grass seed across a newly dug channel and onto a carefully sculpted field. Cleaning up a toxic mess left by an aluminum plant's 50 years of operation is no simple task. 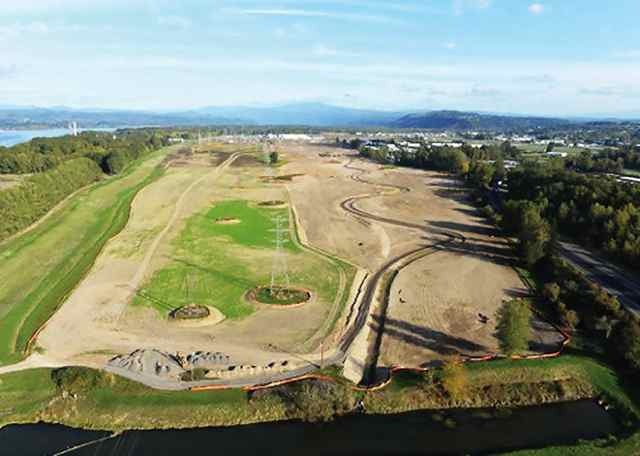 But eight years and $55 million later, the Port of Portland is nearing the end of the second phase of developing the Troutdale Reynolds Industrial Park and finishing its largest ever wetlands mitigation project just to the west. Butler, a senior mitigation specialist for the Port, is in charge of making sure it works. That means carving deeper curves into a straight drainage channel, finding logs and root balls and anchoring them so they won't float away, sculpting low spots, reinforcing high ground, acquiring thousands of plants, 3,000 pounds of seed and preserving a newly-discovered Native American archeological site. All while working with an alphabet soup of federal agencies protecting airspace, levees and power lines. "It's a challenging site because there are so many constraints," Butler says. Work on the 90-acre mitigation project is visible from Marine Drive between 223rd Avenue and Sundial Road. Meanwhile, Port contractors are finishing up work farther east on six industrial lots bordered by Sundial and Graham roads, and three lots inside the mitigation project. When roads and utilities are finished the port will have 184 more acres ready for business. That's in addition to a regional FedEx Ground facility that opened on 78 acres the north side of Graham Road in 2010. At 700 acres, the Troutdale Reynolds park is the largest redevelopment and mitigation of a former Superfund site in Oregon. Back in 1941, Reynolds Metals built an aluminum reduction plant in the vast floodplain of the Sandy and Columbia rivers to support the U.S. war effort. It employed hundreds with family-wage jobs through 1991, when operations were curtailed. It restarted in 1998 but partially shut two years later after Alcoa acquired it. The plant closed permanently in 2002. The Port of Portland bought the site in 2007 and began the process of making it suitable for industry. Because of its location and developing the new industrial sites, the Port had to repair and enhance the large wetlands area on the west side of the property. When finished next year, the changes are designed to improve habitat, provide flood control and protect water quality. "A lot of developers wouldn't take on this kind of project because of its size, the expense and the long timeline," says Melanie Mesaros, a spokeswoman for the Port. The state is spending $27 million to change the Interstate 84 interchange at Troutdale and helping with improvements to Graham, Swigert and Sundial roads. Also, Metro contributed $8 million and Troutdale $1.1 million for road upgrades. The Port plans to have the nine new industrial lots ready to go by the end of next year. That means finishing grading, work on two roads and installing all utilities. The types of businesses generally attracted to such sites are light manufacturing, cold storage and regional distributors, said Ken Anderton, the Port official overseeing the entire project. "As companies try to get product out faster, they look for a site in a region closer to their customers," he said. "They want multiple sites to look at, they want them ‘shovel ready' and they want to be in operation in 12 to 18 months." Already, the Portland Development Commission is looking at the new lots to help relocate the U.S. Postal Service's regional distribution center from Northwest Portland. Anderton said the Port's work has attracted the attention of the U.S. Environmental Protection Agency and even a delegation from Victoria, Australia, which also has a closed aluminum plant. "The EPA and Port hopes this can be a case study on how to effectively clean up and develop a Superfund site," he said. In the mitigation area, graders have finished sculpting the new channel and wetlands. The channel will direct water through a weir and into a reservoir on the west edge of the property. From there, it is pumped it over a Corps of Engineers levee and into a wetlands that feeds into the Columbia River. Because of all the changes in the Port's wetlands area, Butler said, the trick this winter will be managing the water's flow into the reservoir. "It will flood at some point when we get a big weather event," she says. "Over time it will just do what it will do -- and that's the point." The Port will help slow the water by planting 98,000 native shrubs and trees in stages over the next few years. It will take two to three years before the shrubs are established, eventually growing to 10-15 feet high. Because of airspace restrictions, trees are limited to a few areas. The wetlands also had to be designed so there was little open water, which attracts geese that could interfere with planes. A big, but pleasant surprise came when the Port discovered the Indian archeological site -- a high mound well above flood levels -- in the middle of the wetland. Carbon dating on two hearth structures indicated they were 1,200 years old. Tool fragments and other charcoal dated back 3,500 years. It is one of the oldest identified sites in the lower Columbia River, said Dana Green, the Port's natural resources manager, and used as a seasonal camp for processing vegetables and food. When finished, the Port will continue to own and manage the wetlands. Interpretive signs will go up on a new segment of the 40-Mile Loop Trail on its north edge. "This is a mitigation site -- mitigating for all the fill done in the industrial area," said Butler. "The goal is to bring it back to what it was historically."